The in basket: Charles Ely says he thinks fledgling cormorants who are hatched under the Warren Avenue Bridge in Bremerton are crash landing on the roadway above while learning to fly and are unable to get off the bridge deck since the recent alteration that walled off the driving surface from the edge of the bridge. It leads to “squashed cormorants,” he said, and he wonders if creating a break in the barrier would be helpful. The out basket: Claudia Bingham Baker of the Olympic Region public affairs office says, “We are aware of the large population of pelagic cormorants that consider the Warren Avenue Bridge their home. At various times (i.e. when we painted the bridge a few years ago), our biologists have monitored the behavior of the birds. “They found that the cormorants nesting on the underside of the bridge flew under, not over, the bridge. The behavior your reader is describing is a bit out of character for the birds, and (for now), we don’t believe the pedestrian barrier has an effect on their behavior because it did not change the barrier’s basic configuration. “Pelagic cormorants are migratory birds and are protected, but they are not endangered. These particular cormorants don’t even migrate – they stay put at the bridge. The in basket: Janice Smith called in mid-January to ask whether the city or county is responsible for the ruined guard rail where Callahan Drive and Lebo Boulevard access the Warren Avenue Bridge southbound and when it would be fixed. It has been marked off by cones for many weeks and what’s left of it wouldn’t be able to stop much. The out basket: It was a couple of weeks before I heard her voice mail and that very day a large electronic sign showed up in front of the guard rail suggesting at least the “when” of the repair – February 12. It says those ramps will be closed that day. The county isn’t involved and it’s the city’s job. Managing Street Engineer Gunnar Fridriksson of the city told me there had been uncertainty about the responsibility in the past but that was clarified last year. Jim Orton, city Public Works operations manager, adds. “We are replacing that section of guardrail on the 12th of February. There will be a detour route initiated while the contractor is replacing the damaged section. 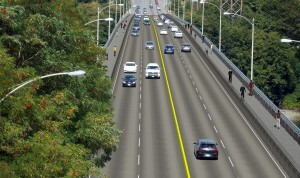 The in basket: Curt Bay says he’s been taking the off-ramp more often lately from the northbound side of Warren Avenue Bridge in Bremerton to get to Callahan Avenue. The same off-ramp also serves Clare Avenue, and he’s seen a number of drivers who had come up Clare and merged with Callahan then turn left onto the northbound on-ramp to Wheaton Way. He wonders if that is a legal turn. The out basket: It’s an unusual intersection, with two streets served by the same off-ramp, and westbound Callahan going from two-way to one-way traffic going in the opposite direction at that spot. But yes, turning left onto the on-ramp there is legal as long as a driver on Clare yields to cars coming off the bridge on Callahan, and to any oncoming traffic. A U-turn is illegal, though, as there is a sign there prohibiting that. Where did patriotic banners on bridge go? The out basket: The city moved them to a spot that provides a better chance for drivers to notice and read them, and where wind won’t wear on them so much, says Bob Tulp, operations manager for Bremerton public works. That spot is at and near the intersection of Highway 304 and Farragut Avenue near the Puget Sound Naval Shipyard gate on its west end. Lynette George heads Blue Star Banner Program of Kitsap County, the organization that has campaigned to get the recognition banners displayed on local streets. Gold stars denote those “who have given the ultimate sacrifice and died while serving,” as George’s Web site puts it, and will be displayed indefinitely. Blue star banners recognize someone serving in the military, who will be presented with the banner when he or she gets out. “Lynn goes out and gets the money and works with the government entities to get them hung,” Bob said. “When our staff goes out and hangs them on a Saturday, we are donating our time and equipment.” There is often a ceremony when a gold star banner is hung, if the family wishes, he said. A motorcycle group often takes part. The flags were on the bridge for a year or less before being moved several months ago, he said.